Bienvenue à Casa Marquez Loft!- Bien que le calendrier puisse sembler non rempli en ligne, env. 50% des réservations sont effectuées jusqu'en 2019 et font référence à d'autres maisons que je possède qui pourraient être disponibles. (Casa St. Francis- Vrbo # 325257) Veillez donc à entrer les dates pour votre séjour souhaité afin que je puisse confirmer la disponibilité et les promos. Nos maisons vrbo ont reçu plus de 70 étoiles, cinq étoiles de nos invités satisfaits. Impressionner vos invités avec un haut de gamme, à deux niveaux, Loft de Prestige à distance de marche de Whole Foods, Trader Joe, Maria, Railyard, Santa Fe Farmers Market, Santa Fe Baking Company, Backstreet Bistro et plus encore! Cet amusement, contemporain, loft haut de gamme est idéal pour les réunions, réunion d'amis et la famille avec cuisine et ustensiles complète et salle à manger. Ouvert environnement spatial loft sur deux étages avec chambres fermées / zones de couchage privées. Deux chambres à coucher queen size 4 couchages. dort Futon deux. 1 1/2 bains. Bureau avec bureau pour ceux qui ont besoin de travailler et de communiquer avec le bureau .. 2200 espace de pieds carrés avec salle à manger, salon bar, cuisine, salon / espace de divertissement et plus encore! planchers en bois de bambou étage supérieur / chambres. laveuse Deluxe et sèche-linge. . Beaucoup d'espace et beaucoup de peinture-ouvrière Méditation / divertissant que vous s'il vous plaît. A propos de quart de mile de Santa Fe Plaza, à quelques minutes de la Fe bassin Santa Ski où 150 pouces chute de neige de l'année. 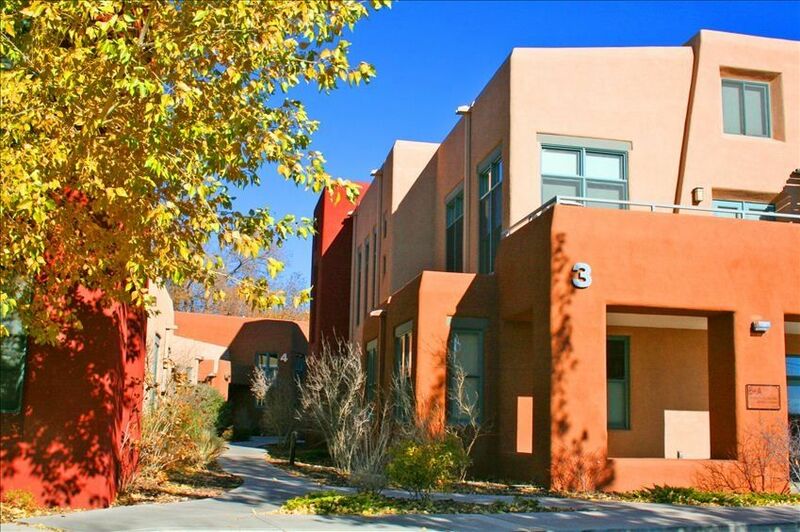 World Famous Santa Fe Opera, Santa Fe Cuisine, Divertissement, le marché indien, marché espagnol, Arts et artisanat, World célèbres galeries d'art, Shopping font de Santa Fe le point 6 de vacances le plus visité aux États-Unis - Conde Nast. Bienvenue livre avec des recommandations sera fourni. Ceci est un espace loft de luxe sur deux étages. Espace ouvert avec 2 chambres à coucher pour la vie privée. Idéal pour divertir et profiter de Santa Fe avec d'excellents endroits pour faire du shopping, acheter des provisions et dîner tous à distance de marche. Beautiful spacious loft close to everything! My husband and I stayed here for two nights and loved everything about it. The openness, the location, the quiet neighborhood, and the fact that it was stocked with everything you need. The loft is filled with art, treasures and artifacts - those touches that make it unique and special. Francis provided all the pre-check in information that we needed, and Michael was there to greet us and show us around. The communication and responsiveness was appreciated. We will stay here again on our next trip to Santa Fe! Fabulous condo. Great condition and location. Perfect for Santa Fe getaway. Wonderful, warm, comfortable and beautiful loft....we loved our stay here! What an amazing loft!!! There were 4 of us and it was too much space to surprise based on the typical "loft" expectation! The room on the right is definetly cooler, but they provided a space heater in case it is needed. The room on the right is warmer; but I found if we left the fans running and the bedroom shutters open the room stayed at temp with the rest if the loft on the right! Omg the heated floors on the main level are amazing!!! The kitchen was perfect, and 2 outdoor patios make this place amazing!!! I will choose to stay here again in the future! Downsides: the front door does stick and takes a little muscle to close to ensure proper lock engagement, I.e. my or my friends husband had to help me everytime we left the loft.... and the sound control in the loft is fairly non existent.... We were with best friends, so we felt at home! There we're tons of things within walking distance, even though we didn't visit the majority of them(still kicking myself for not stopping at the flea/antique market on the corner), and everything else is within 1 to 2 mile walking/driving distance with fairly cheap to free parking. There is a Shuttle that takes you to the new Tesuque casino for free but you have to take an uber from the loft. Only 5 to 7 bucks at most each trip to the plaza where pickup is, but worth it to aviod driving out into the middle of nowhere. Overall 10 of 10 stars!!! We'll be back! The space was lovely. My friends and I really enjoyed the loft and intend to stay again! The property was spectacular. Santa Fe is amazing and the loft made it so much better. The hosts were very respectful of our privacy and allowed us to have freedom in the space. I will definitely be considering this place again on my next stay! This rental is absolutely fantastic! Sparkling clean, spacious and is stocked with plenty you may have forgotten. Excellent location, great customer service.